My endocrinologist was listening to my heartbeat during a recent checkup and noticed my necklace. It had two charms: a silver circle that’s engraved with “Your Story Matters” and a bench. “What’s the significance of the bench,” he asked as he pulled the stethoscope from his ears. I told him about how I believe stories matter and I always want to be willing to sit down with someone, share mine, and hear theirs. intertwined when we least expect it. My endocrinologist is from Guatemala but is raising his family here in Kentucky. In 2015, we talked about the mission trip I went on to his homeland. He told me about how missionaries like the ones we support are how people’s lives are changed there, especially in the rural villages outside Guatemala City. I told him at this recent appointment that I was going back to Guatemala for a week this summer. He thanked me and asked about what we would be doing. Like our trip in 2015, we’ll be spending most of our time in and near Chichicastenango in the mountains. This time we’re taking both Cate and Ben. We’ll help build houses, distribute wheelchairs, visit families in their homes, and distribute clothes, school supplies, and toiletries. We’ll see needs like education sponsorships and building projects that Bethel Ministries will continue to meet long after we’re gone. We’ll pray with them and for them to our God who works over our language barriers. I haven’t even gone yet, but he thanked me for my willingness. In the doctor’s office recently, we each shared a small piece of our stories and that brought understanding and gratitude – as if we were on a bench together. Sit down on the bench. Linger at the table after dinner. Start conversations in waiting rooms and check-out aisles. Be willing to share pieces of your story because that’s one way to be a faithful steward of your life. Hear pieces of someone else’s story because, really, we aren’t that different. Recognize that God meets us in those conversations and works all things together for His good and our good when we’re following Him. When that happens, benches become sacred spaces. 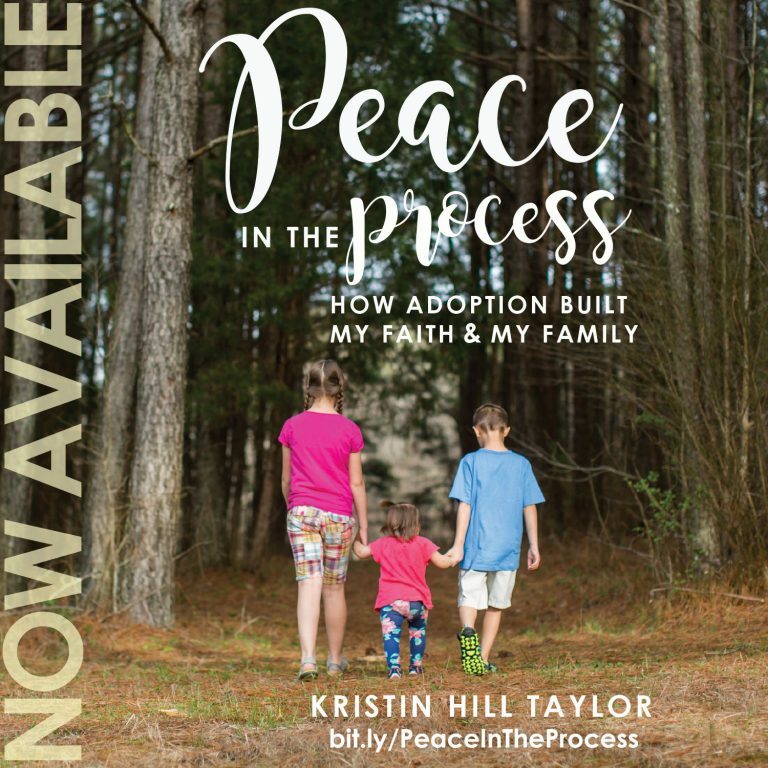 The necklace was a gift from my two best friends not long after I initially self-published “Peace in the Process: How Adoption Built My Faith & My Family” as an ebook in 2014. (That ebook has since been expanded to include more of our story and is now available in a paperback book as well.) I wear the necklace regularly, love the conversations it starts, and am grateful for the deep friendships it represents. 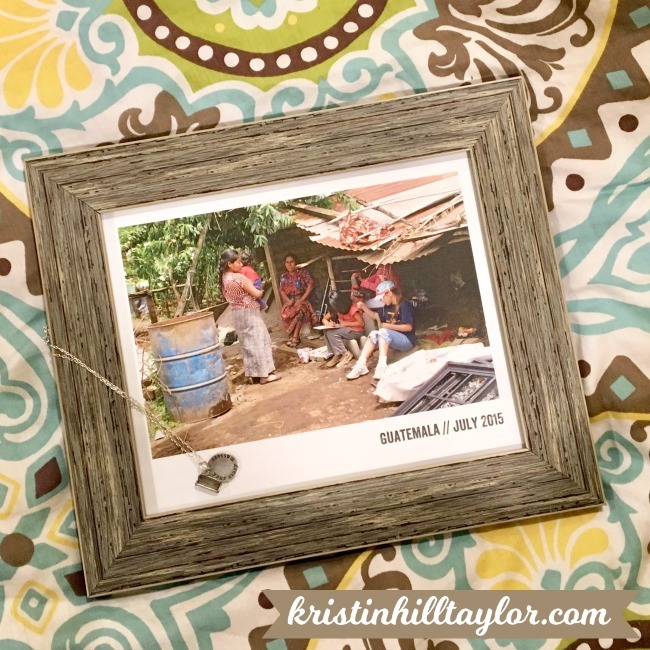 I’m sure I’ll talk more about Guatemala here as our trip approaches and once we return, but you can always read more about our trip from 2015 and how it changed our family. Until then, our family and team appreciate your prayers as we prepare to go. Of course, #PorchStories is one of my favorite places to share stories, so thanks for being here. 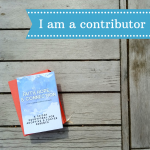 If you haven’t already I’d love for you join me on my virtual porch, where we can continue sharing stories with each other. This is a lovely post! I agree, there is so much power in taking time to share our stories. Your trip sounds exciting! Thanks for being here, Lesley! This is especially convicting to me because in our neighborhood I regularly see 2-3 ladies sitting in lawn chairs under a tree, and as I pass by and wave on my way to and from errands, I think, “How do they have time to do that?” I have been thinking I should probably stop and join them sometimes. I’m too often caught up in my to-do list. God knows what He wants me to do, but He also wants me to make time for people on the bench, in the lawn chairs, in the grocery store aisle, etc. I know the temptation to put projects before people, and my to-do list still sometimes distracts me. I’m hoping you get some people opportunities – maybe put them on your list! 🙂 Thanks for being here, Barbara! Love this today, Kristin. Stopping to take time is so precious. We leave seeds along our life’s path, and also glean from others. Our lives become a beautiful work of art by God’s leading! Thanks for sharing this. Praying your trip is all it can be according to the way the Lord wants it. Thank you for your encouragement and prayers, Meghan! What a beautiful reminder that we need not seek out perfectly arranged opportunities to share our hearts; we need only to use the moments we are given. Keep on friend, keep on. 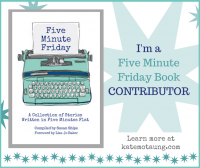 It’s amazing how much gets shared from our bloggy benches, and how near and dear the friendships can become. I’m thankful, too, for my real life benches and for the people who join me there. Looking forward to hearing more about your trip. Thanks for sitting here with me, Rachel! It is amazing how God crosses the paths of people both on our real and virtual benches. I am most grateful He crossed ours! Benches. Couches. Dining room table and chairs. Porch swings. Beach blankets. Sand chairs. ALL SACRED PLACES. Really liked this post, Kristin. As I started to write again, I wondered if you were still hosting a link up (that comment shows I haven’t been good with keeping up… sorry). I’m not sure if I’m ready to begin linking up again but nice to see you building what looks to be a beautiful community. I listened to that podcast and love your thoughts here. Thanks for caring about our stories and sharing yours! I’m so glad you’re here, Lauren!